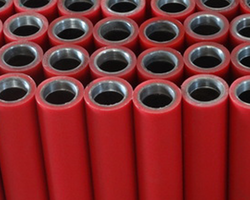 Cast Polyurethane Rollers offered is made available by us in varied configuration choices so as to perfectly match up with the demand of different process applications like in feed rollers, drive rollers, idler rollers, conveyor rollers and others. 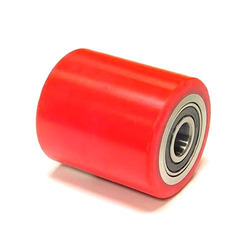 Further, these polyurethane rollers feature different sizes and shapes like as straight rollers, hourglass rollers, conveyor rollers, slip-on rollers, radius rollers and others. Some of its features include comes with superior anti- abrasive properties; available in form of finished machined & molded components; available in wide shore hardness; provide for optimum noise & vibration damping support; come with greater load bearing capacity; offering superior resistance to aliphatic hydrocarbons, grease and others. Resistance to o greases, aliphatic hydrocarbons, oxygen and ozone. 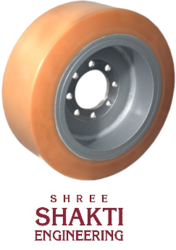 PU Pallet Truck Wheels offered can be made available by us in durable construction finish as well as in different finish configuration choices so as to match up with the specific usage demands in stackers, forklift trucks, pallet trucks and other material handling equipment. Further, these wheels and castors feature light duty finish with polyurethane tread of different shore hardness. Some of its features include available with/without ball bearing support; pallet truck wheels developed as per industry standards; can also be made available in OEM specifications; providing for moisture proof and longer service life; offering high performance working support among others. PU Printing Rollers offered come in durable construction finish and are designed to provide for better and longer service life. Further, the quality finish of these rollers also ensures excellent and consistent printing results. Some of its features include available in different configurations to meet application needs of printing industry; easy to clean construction finish; provide for fine print quality; superior dimensional accuracy with high corrosion and abrasion resistance; finding use in rotary and offset printing processes; choice of different cylindrical sizes and diameters; can also be developed in OEM specifications; available in options like Flexo roller, Gravure printing roller, Offset printing roller, Tin printing roller and others. 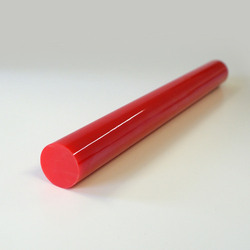 Polyurethane Converting Rollers offered can be made available by us in different finish configuration choices and find application usage in conversion process. We can offer these rollers in different hardness range as well as in high load bearing capacities. Some of its features include provide for reduced operational noise; offering better resistance to corrosion, ozone, oil and low temperatures; available in different options as straight roller, v-groove roller, concave roller, convex roller and others; choice of different hub material like steel, brass, aluminum; bearing choices in form of sintered bronze, plastic, needle; made available at competitive prices as well as in OEM specifications as per specific work/industrial applications. We offer competitive pricing and timely deliveries. We also assist you in identifying the ideal polyurethane solution for your specific work/industrial application. 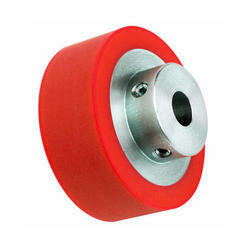 Polyurethane PU Wheels offeredcomprise quality range of polyurethane castors that can be made available by us in both standard as well as customized finish specifications so as to match up with the specific work process application demands of the customers. Made available at competitive price, these PU wheels find extensive use in areas like pallet trucks, manipulators, fork lift tyres, stackers, roller skate wheels, friction wheels, rotators and others. Some of its features include coming with low wear and tear resistance; have high load bearing capacities; providing for non marking usage and low rolling resistance; offering superior resistance to oil, grease & chemicals; can provide working support in temperatures from -40c to 80c; offering optimum bonding support with various insert materials; excellent elasticity and shore hardness properties. 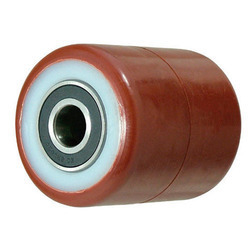 Polyurethane Rollers offeredcan be made available by us in different configuration choices and come developed using quality polymers in different sizes so as to match up with the specific process application needs of the customers. Some of the areas these are used in include as conveyor belt rollers, sheave rollers, paper mill rollers and others. 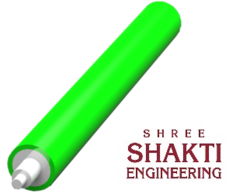 Some of its features include availability in different thicknesses, sizes and color options; available in hardness from shore 10A to 80D; varied roller options including ink roller, printing roller, cam roller, bridle roller, taper roller and others; provides for high impact resistance and flexible usage; offering superior resistance to oil, ozone, low temperatures; can also be custom made a demanded by the customers. PU Stock Material offeredprovide for superior elasticity of rubber as well as toughness and durability as provided by metal. We can offer these stock materials in varied hardness range with optimum abrasion resistance and physical properties. Some of its features include provide support for reduced maintenance; better abrasion and tear resistance properties; come with higher load bearing capacity; have superior impact resistance and excellent wear; provide superior usage in comparison to rubber plastics and metal; oil and solvent resistant; available in tear resistant range of 500-100 Ibs./linear inch; quality stock material in form of rods, tubes and sheets; highly resistant to impact; superior flex fatigue resistance and others.